Each summer, the Pre-College Programs prepare student for college success. Students experience the independence and responsibility of college life, as they make new friends from across the country and around the world. Our programs reflect the University of Rochester’s open curriculum – providing students with the skills necessary for success in college and guiding them in their exploration of potential majors. Outside of class, students participate in a rich program of events and activities filled with workshops and activities that help you make friends and prepare for college life. Students select their program and specific classes they are interested in during the online application process. For the Rochester Scholars program, students will select first choice and second choice classes. While we prioritize a student’s first choice, there may be times that we will place a student in their second choice. Classes are subject to a minimum and maximum enrollment. In the event of under-enrollment, the class will be cancelled. If your first choice class is full, you will be placed in your second choice class. We recommend applying early. Half-day students will take one class (choice of morning or afternoon). Full-day students will take two classes (one class in the morning and one in the afternoon). College credit is only offered through our credit-bearing Taste of College Program. Classes typically range from 2-5 credits. A student who successfully completes a Taste of College class will receive college credit that is transferrable to most universities. The Intensive Studies and Non-Credit Courses include fun, hands-on activities, with little to no homework and no grades. You will be challenged, but also encouraged in your learning experience by the instructors. You may be asked to participate in a group activity or individual research project as part of the class experience. The Credit-Courses (Taste of College Program) will be college-level material and will consist of homework, projects, quizzes and tests that will influence your grade for the course. Professors will distribute a syllabus on the first day of class outlining the workload and what additional books and materials may need to be purchased for the course. If your class requires the use of a computer, accommodations will be made by the instructor. There are a number of computers available on campus that you may use during your lunch hour. See a list of public computer areas. Residential students may elect to bring a laptop computer. Residence halls are wired to provide Internet connection. For the Intensive Studies and Non-Credit Courses, books and course materials are included in the program costs. Students in the Credit Courses (Taste of College Program) will be responsible for purchasing their own books and course materials outlined by the professor. Taste of College students can purchase any books or other required items at the University bookstore, and these items are not included in tuition costs. Classes are held on the University of Rochester River Campus and the University of Rochester Medical Center, including the School of Medicine and Dentistry and the School of Nursing. Classes are taught by University of Rochester faculty and graduate students, and top local educators. If you are enrolled in an Intensive Studies program or Rochester Scholars morning class, you will attend class from 8:30 to 11:30 am. Lunch will be served in the dining hall from 11:30 am to 1:00 pm. Afternoon Intensive Studies programs and Rochester Scholars classes run from 1:00 to 4:00 pm. Class times for students enrolled in credit-bearing undergraduate classes through the Taste of College program vary, but classes typically run for a total of three hours daily and are held three to five days a week. Students will enjoy a wide range of food options at dining halls, coffee shops, and restaurants all over campus. Vegetarian and kosher meals are available at most locations or upon request, and the dining halls will work with students who have dietary concerns. Further information can be found through Dining Services. An on-campus dining plan is included in the residential program costs. Breakfast, lunch, and dinner will be served Monday through Friday. Brunch and dinner will be served Saturday and Sunday. Upon arrival, residential students will be issued an ID card, which they may use for dining services on campus. Money left over on a student’s meal plan at the end of the program is nonrefundable. For commuter students, lunch in the campus dining hall is provided daily. Commuter students will be responsible for getting to and from campus. Residential students will live in the residence halls on campus. Residential students will be housed in one of the first-year residence halls on campus. The residence hall has lounges on each floor, kitchenettes with several micro-fridges for students to share, study rooms, and a laundry facility. Please note that the residence hall does not have air conditioning. The summer weather in Rochester is typically a mild to warm temperature, so please plan accordingly. There is a curfew in place because our Pre-College Programs students are minors. Residential students must check in to the residence hall by 10:00 pm Sunday through Thursday, and by 12:00 am Friday and Saturday. Students must remain in the residence hall until 7:00 am. University ID cards are collected each night as part of the check in process, and will be returned to students the next morning. Students must provide their own linens (sheets, blankets, pillows, towels, etc.). You are allowed to bring a small micro fridge and a small fan with you to campus to keep in your room. 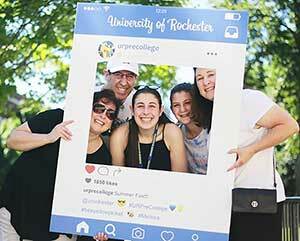 The Pre-College Counselors (PCCs) are current University of Rochester students who act in a similar capacity to a college resident assistant you would find in a residence hall on campus. These students serve as an adviser and mentor in residence for the Pre-College Program students. The Pre-College Counselors have been through an extensive training process to ensure that they can handle a variety of situations. They live in the residence halls with the Pre-College Programs students over the summer and are available all day, every day. They are a great resource for high school students looking to talk to a current college student. The Pre-College Counselors have knowledge not only of the campus and the Rochester area, but can also provide some insight to college classes and various subjects a student might be interested in studying. They help supervise activities and events that take place in the evenings and on the weekends, and ensure that each student has a positive experience and a memorable summer! Along with the Pre-College Counselors, our staff includes several Resident Health Counselors. These are current University of Rochester students who participate in an organization called the Medical Emergency Response Team (MERT) during the academic year. These students work alongside the Pre-College Counselors to ensure the overall health and safety of Pre-College students. These Resident Health Counselors have a background in the medical field and are all first aid trained, CPR and EMT certified, and are familiar with Strong Memorial Hospital. They live in the residence hall with the Pre-College students and are available 24/7 to assist students. While these students have extensive training, they are not certified counselors to assist with mental health concerns that may arise, however they are connected with Public Safety, University Health Service, and the University Counseling Center as additional resources. We try to make the summer experience as much like a first-year college experience as possible, and part of that experience is learning to live with new people. Therefore, you will share a room with another Pre-College student. In rare circumstances, there may be three students to a room. You are matched with your roommate based on gender and location. We try to put students together who are in different programs and who are from different states or countries to give students a diverse experience. You will live in a residence hall with other students from the program, where you’ll be able to participate in activities planned by your Pre-College counselor. Students will receive their room and roommate assignments when they arrive on campus to check in for the program. We are unable to release roommate information, as this would be inconsistent with the Family Educational Rights and Privacy Act (FERPA) guidelines. Furthermore, housing assignments are being made and changed right up until the time students arrive on campus. Tuition, room, and board are included in the residential program fee. Residential students have access to the University of Rochester’s facilities, including campus computer labs, libraries, Wilson Commons, and the Goergen Athletic Center—including a wide range of cardio and weightlifting equipment, a 200-meter track, the Aquatic Center, and basketball, volleyball, tennis, squash, and racquetball courts. The residential program fee does not include transportation to/from your home city, transportation to/from the airport/bus station/train station, laundry, linens, blankets and pillows, personal spending money, meals eaten off campus, or medical expenses. Additional fees may apply for special events and off-campus excursions. Students may bring additional spending money for items that are not included in program fees, such as snacks and drinks from the vending machines, restaurants in College Town, and souvenirs. JPMorgan Chase Bank ATM and Advantage Federal Credit Union ATMs are available throughout the River Campus and Medical Center. Pre-College students are introduced to their class locations during the Welcome & Orientation Session the Sunday before their classes begin by the Pre-College Programs staff. During the programs, students are free to walk around campus on their own. They may visit the libraries, dining center, Wilson Commons, Starbucks, and may other community spaces on campus in between their classes. Students are not allowed to leave campus without the supervision of a Pre-College Programs staff members or a Pre-College Counselor. Students living in the residence halls are supervised by Pre-College Counselors, current students at the University. Residential students observe a nightly curfew and check-in process. Evening and off-campus activities are also supervised by the Pre-College Counselors. We provide a campus map with class locations during the check in process, on our website, and through emails sent to students and parents. We recommend that you keep the Office of Pre-College Programs’ phone number, (585) 275-3221, programmed into your cell phone in case you get lost. You can also download the “UR Mobile” app, which is a great resource to stay up to date on campus events, maps, parking, dining, and more! It is important that you wear your lanyard and name tag at all times so that staff members can identify you as being part of the program. The Public Safety Services office is located on campus at 612 Wilson Blvd. Security can be reached at any time at (585) 275-3333, by dialing 13 from any campus phone, by dialing #413 from any AT&T or Verizon phone, or simply picking up a Blue Light Emergency Phone, an extensive network of over 500 interior and exterior public-access telephones that immediately contact Security Services. If you become sick during class, notify your instructor so they can contact the Office of Pre-College Programs. We will then contact your parent, guardian, or emergency contact designee to come pick you up if you live locally. If you are a residential student and you become sick, notify your Pre-College Counselor or Resident Health Counselor immediately, so we can make sure necessary steps are taken. The University will provide accommodations to assist disabled students. If you are seeking assistance, please contact the Office of Pre-College Programs in advance to be assured of accommodations upon your arrival on campus.